Property in Fethiye Turkey for sale, FIRST choice of overseas home buyers, wonder why? Fethiye properties offer everything from beaches to mountains on Turkish Lycian coast. Sunny Fethiye is perfect for anyone who enjoys beaches and culture but is reluctant to battle hordes of tourists. There is a wealth of attractions right by your property in Fethiye, including Turkey’s most pictured Oludeniz Beach, the Blue Lagoon, the abandoned ghost town of Kayakoy, rock tombs and more. Fethiye’s appeal lies in its authenticity: unlike other resorts, it is not merely a holiday home destination but has a thriving agricultural and fishing industry. Fethiye properties offer a year round base for foreign buyers looking for retirement homes. Sailors flock to the area, attracted by the picturesque islands scattered off Fethiye’s coastline. Fethiye’s superb marina facilities mean yachts have a place to dock after traversing the stunning gulf of Fethiye, one of the most beautiful sailing routes in the world. 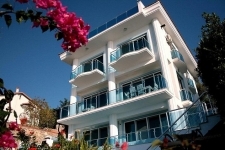 There are also a few beachfront properties for sale in Fethiye. Beaches and long summers make the area perfect for family holiday homes in Fethiye. Its year-round warmth and strong expat community make it ideal for a permanent base. Rentals on Fethiye property are getting higher year on year as holidaymakers increasingly seek out holiday homes in Fethiye from as early as April through to the end of October. Property for sale in Fethiye is very favourably priced and there are a good number of bargains to be had. Fethiye homes for sale are diverse; you’ll find sea view property in Fethiye’s fashionable harbour, roomy mountain-view properties in Ovacik, large family homes in rural Uzumlu or sun-drenched properties in Calis Beach. Beachfront homes in Sovalye Island are ideal for those who seek privacy and private mooring for their boats.